Publisher December House is posting several new short fiction pieces every day of November. Many of the stories have a "science fiction feel". Sean Craven's stories feature Henry Cleary; the Colonel, who's a rooster genetically engineered to have teeth and a long muscular tail; and many other science fictional biological oddities. Note that the stories are only available free through the end of November, so check them out soon. EMBRAPA, the Brazilian government's agricultural research agency, successfully cloned a cow in 2001. Since then they've been refining their cloning program to the point where they have now announced they are going to try cloning endangered species. Their list includes eight animals on the threatened species list, such as the maned wolf (Chrysocyon brachyurus), the jaguar (Panthera onca) and the black lion tamarin (Leontopithecus chrysopygus). EMBRAPA has stated that their goal is to keep the cloned animals in captivity and only use them for restocking zoo populations and study, rather than releasing them to the wild. But it makes me wonder: is cloning a good use of resources in situations where the wild populations are at risk? Dr. Mark Boguski has a message: "The time of the $1000 genome meme is over. It served us well for years – driving advances in instrumentation, chemistry and biology. But now it is reducing clinical credibility. It’s time for it to leave the lexicon of healthcare; it has to go." The fact is that genome sequencing for cancer patients is expensive (far more than $1000), not covered by insurance, available to a relatively limited number of people, and might not be that informative clinically. He argues that the focus should be on precision diagnostics, which involves "big data" and analytics. And because this article is in Forbes, that means that Boguski and colleagues have started a business - Genome Health Solutions - to do just that. It seems to me that with potentially limited research funds it's not clear whether scientists should be striving to make genome available and affordable for everyone, or if it would be better if they instead focused on deeper analysis of the existing data - or, ideally, if both approaches are possible. Which would be better for the average cancer patient is still unclear. 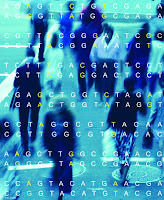 Image: SNPs: Single Nucelotide Polymorphisms, Office of Biological and Environmental Research of the U.S. Department of Energy Office of Science.science.energy.gov/ber/. Used with permission. While it may be popular to argue that the human race is evolving to be dumber Idiocracy -style, the good news is that we're probably not actually getting less intelligent as a species. We won't even become beautiful-but-dim Eloi. In the linked article Neuroskeptic explains how two recent articles claiming that humans are getting dumber are based on faulty assumptions. Harvard geneticist George Church, SF author/futurist David Brin, and futurist Jamais Cascio, discuss the speculative possibility of "Hacking Obama's DNA". I'm glad the Huffington Post included a geneticist in the discussion! Thanks for the shout-out! I have to admit, I was a little nervous when I was asked to do a series of background notes for the stories, but they seem to be working o.k. I'm a "background notes" aficionado myself, so I thought that was a great complement to your stories.